Peco InspX Corporation announces a new solution for effective detection of vent tube fragments in sealed beverage containers using their side-view full container X-Ray inspection systems. Peco InspX is a leading provider of advanced inspection solutions for the food, beverage and pharmaceutical industries. Peco InspX’s full container X-ray system is capable of detecting extremely small pieces of a vent tube, virtually eliminating any possibility of the presence of foreign material in each individual beverage container. Additionally, the latest Peco InspX software algorithms allow accurate detection at a phenomenally low false reject rate. In beverage can applications, the false reject rate is less than 1 per million inspected containers. Peco InspX full container X-ray systems can also perform fill level monitoring and container integrity inspections on cans at full line speeds of up to 4000 containers per minute. According to Peco InspX CEO Rich Cisek, one of the challenges in vent tube detection is the ability to detect even the smallest pieces of vent tube without generating false rejects. These high-performance side-view X-ray systems excel at providing this capability with both steel and plastic vent tubes and can also detect other small pieces of foreign material. The same X-ray system can additionally monitor the performance of individual filler valves. 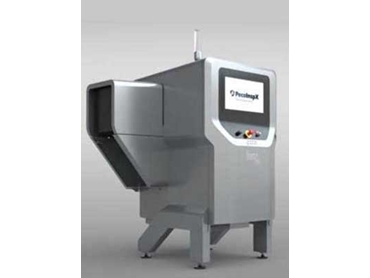 Peco InspX Corporation and InspX Corporation are leading providers of advanced technology inspection solutions for the food and beverage industries. Headquartered in San Carlos, CA, the company serves customers around the world with their systems inspecting over 120 million food and beverage containers daily. The company specialises in high speed package inspection machines that combine ease of use with a low cost of ownership. Peco-InspX is represented in Oceania by HBM Packaging & Plastics Technologies .